I may have been a bit lax on the blog lately, but I’ve been writing quite a bit (chau, dissertation). I’m pretty excited about my most recent book review: not only was it for Music & Literature—one of my favorite mags—but I also got to talk about the latest translation of a book by Mario Bellatin, a writer with whom I’m completely enthralled. The book is Jacob the Mutant, translated by Jacob Steinberg and published in a gorgeous edition by Phoneme Media. I’m particularly fond of this work because it belongs to a series of texts and public interventions in which Bellatin plays games with those things the literary establishment holds most sacred: above all, the ideas of authorship and originality. Remember that press conference when—after one journalist insisted the writer name a literary influence—Bellatin invented a Japanese writer named Shiki Nagaoka and then doubled down on his ruse, writing an apocryphal biography of the man? Jacob the Mutant is sort of like that, only this time the game revolves around an apocryphal text. Even better, the Phoneme edition makes an explicit point of being what all translations are, implicitly (and sometimes begrudgingly): an original work. 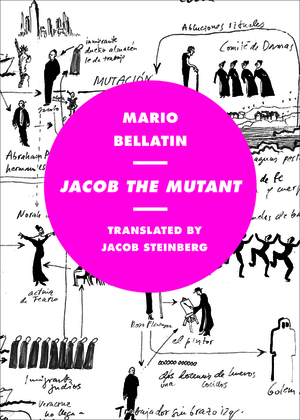 Thanks to a translator’s afterword brilliantly conceived by Steinberg to mirror the strategies employed by Bellatin, Jacob the Mutant is truly a text in dialogue with its earlier Spanish editions, and it wears this originality proudly. When we talk about translation, too often we talk about what is lost. The brilliance of this translator’s afterword—which does not comment on Bellatin’s text but rather performs it anew, weaving Roth’s fragments together with Steinberg’s personal history, religion, and family tree—is that it establishes a parity between Bellatin’s productive appropriation of Roth’s narrative persona, and his own, of Bellatin. As a whole, then, that belongs to a greater whole, the recent publication of Jacob the Mutant not only offers the reader a memorable exploration of the compelling but futile drive to hold on to the familiar in a world marked by constant change; it also insists on the status of its translation as the rebirth of a work that, like its protagonist, will continue to take on new and ever vital forms. You can read the rest of the review here. I also wrote a little something about David Shook’s luminous, witty translation of Shiki Nagaoka for Words Without Borders a million (well, two) years ago; here’s that. And now… (Drumroll, please.) Keep an eye out for the Bellatin dossier coming in May from the Buenos Aires Review, which will feature new work from Bellatin and Shook, as well as essays from Edmundo Paz Soldán and Craig Epplin, a conversation between Mat Chiappe and Bellatin in which the latter discusses his feelings about Japan (he has many), and more. For me, at least, the past month has been all Bellatin, all the time—and I can’t say I’ve minded it one bit.